My first Euro Trip had me nervous for months before I went. Everything from the visa applications to hotel bookings seemed like a huge task. Not to mention the fact that one usually plans to travel in between various countries; coordinating train/flight timings and figuring out how to get to your hotel seemed daunting. Luckily I stumbled across a great number of apps and websites that let you plan everything on your own! Google Flight Matrix is by FAR the best flight finder site that I have seen for finding flights from any destination out of Pakistan. There are other well known sites such as Skyscanner or Kayak, but I felt that none of them offered the flexibility or variety of choosing flights that were into or out of Pakistan specifically. Want to choose a flight into Athens, which has not more than 2 layovers and arrives during the afternoon? And want to fly out of Barcelona on a weekend? Just enter those route specifications and one will very likely be found for you. Although I am not a fan of city guides as it is a lot more fun to explore on your own; Get Your Guide offers great discounted deals on Cruises, Big Bus Tours and other travel guide deals which are at many occasions cheaper to purchase online than at your destination. The best place to browse for hotels online. Primarily because their search engine and filters work really well to identify which hotel is suited to your needs of price/location/amenities. Their free cancellation bookings are secure and the customer service on email or on call are always really helpful. One Tip: At times it is useful to use Booking.Com to identify a hotel and then go direct to the hotel website to compare prices, at times they are cheaper. You might also find rooms which are unavailable through Booking.com would be up for booking directly from the site! If hotels don’t fall within your budget, then Hostel World is a great option to look for low cost accommodation. It has hostels with both private rooms and dorms to share- whatever suits your preferences. I found a great hostel in Rome with this website called The Yellow. Want to know how to get from Rome to Brussels and all the possible transport options that you have including estimated fares and changes? Rome2Rio offers ideas for transit not only in Europe but pretty much all over the world. It’s not only useful for travel options from city to the other but also for within the same city as well. The destination ideas also link to relevant train and plane websites for easy booking! This is the BEST website to get reviews for almost every hotel, attraction and tourist location from all over the world. There would be a rare site or hotel which is not featured here. With hundreds of thousands of verified reviews this is the best place to get genuine visitor input. 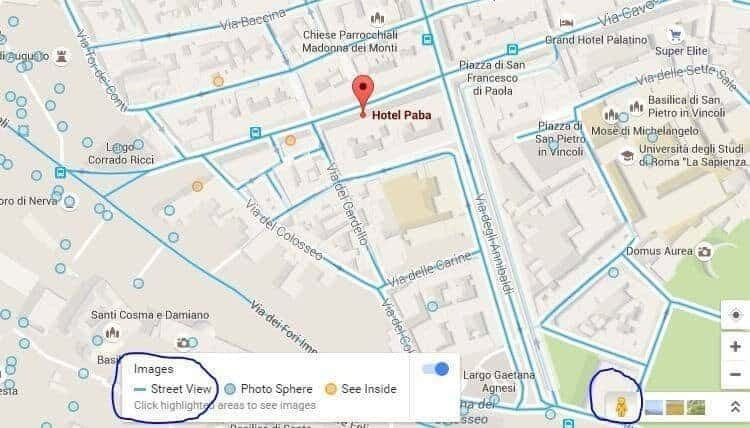 Google Street view is a handy little option which allows you to zoom into streets to see what a locality actually looks like. I find the very useful in picking hotels; you always know in advance what your hotel area looks like, which makes it both easier to identify once you reach or to choose if you want to stay there or not. Google earth helps the same way as street view for longer distances. It is especially helpful if you are travelling near bridges, beaches and mountains. It will show you a good visual how you will need to navigate wherever you are staying.Once you have located your area of interest, simply switch to Earth Mode on maps and see what it really looks like. Strangely, I have not found the Google Maps offline feature very useful, but there are a ton of city and area specific offline maps available on app store which work great. The best part about these is that they work without a data connection. We usually don’t have time to get sim cards as soon as we land, and reaching to the hotel first is usually a priority. Avoid taking taxis as much as possible anywhere in Europe because not only are they insanely expensive; buses or trains will easily take you to as close to your hotel as you need to be; It’s the route to the hotel itself which might involve walking on foot which tends to get a bit tricky at times- offline maps simply track you via GPS and make it really easy for you to navigate to where you need you need to get to- just make you download them in advance when you have access to wifi and check that the places you need to visit are available on the offline map. Hope these help! And do write to me and let me know if you know of any aps that you liked or found helpful!